Despite taking an early lead in this Continental Tyres League Cup group game, a high-performing Rooks team were ultimately unable to keep West Ham at bay. Lewes shocked their Super League hosts here when Danielle Lane rose highest to bury a 7th minute header from a Kate McIntyre corner. 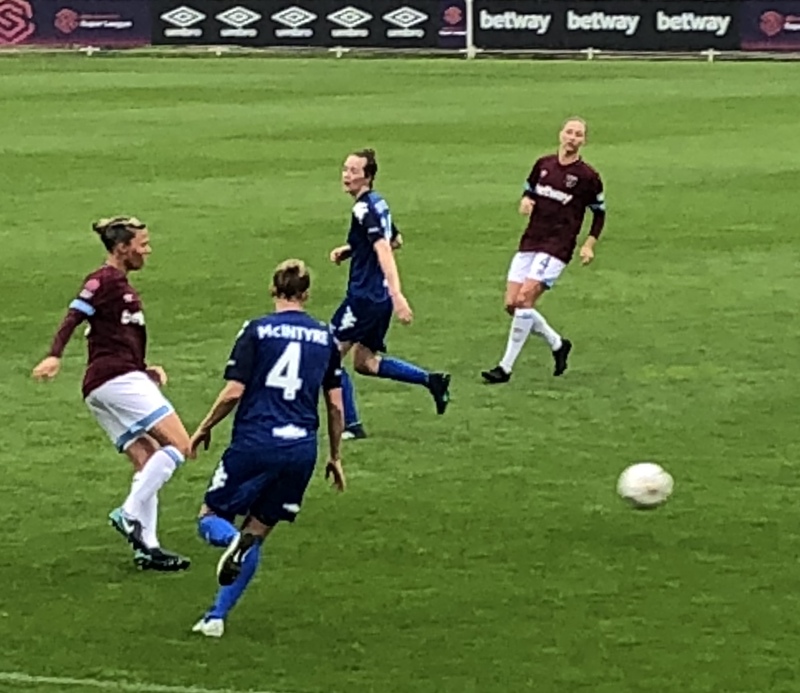 West Ham recovered to score through Jane Ross and player-of-the-match Leanne Kiernan before a goal from Julia Simic and a second-half Jane Ross penalty added a gloss that the hosts just about deserved. Lewes were forced to make a late change when Natasha Wells picked up an injury in the warm-up. Rebecca Carter led the line, with Sammy Quayle wide on the right and Lane in behind, ahead of Kate McIntyre and Leeta Rutherford. Lewes weathered an early Hammers storm, Faye Baker tipping over a powerful close-range Brooke Hendrix header, before taking the game to the hosts. Leeta Rutherford made a solid midfield challenge to release Quayle. Well-marshalled by Flaherty, she did well to win a corner. McIntyre delivered from the right and Lane leapt above her markers to power past Moorhouse. 0-1. West Ham’s response was swift and deadly. Kiernan thought she’d scored on the quarter-hour, racing onto a sharp through-ball before sides-stepping the on-rushing Baker, her shot nestling into the side-netting. Moments later the teams were level, Jane Ross showing her class with a world-class strike from 22 yards. If the crowd though that was good, they were left breathless four minutes later. Kiernan, back to goal on the edge of the D, took the ball down, swivelled and curled a right-foot strike that dipped over Baker and in off the underside of the crossbar. 2-1. West Ham had the wind at there backs and the bit between their teeth. They made it three just past the half-hour, Julia Simic finishing low past Baker after great work by Ross. HT 3-1. The rain returned with the players for the second half and things got worse for Lewes when they conceded a penalty on 49 minutes, Taylor adjudged to have fouled her opponent. Ross lashed home for 4-1. Undaunted, Lewes redoubled their efforts. Taylor, combative, alert, working tirelessly alongside Thompson-Agbro, McIntyre and Rutherford.. Despite West Ham’s superior pace, Lewes bravely held a high defensive line for the rest of the match. Just after the hour Shannon Moloney replaced Charlotte Owen before Lewes bloodied two debutants, Rosie Paye, on for Rebecca Carter, and Georgia Robert for the excellent Boswell. Lane has one more notable break, storming past two defenders before a perfectly-timed tackle by Rafferty ended her run. FT 4-1. Despite this defeat, Lewes remain top for now in their Continental Tyres League Cup group - the top two teams will ultimately progress to the next round. Manager John Donoghue was philosophical after the match. On Millwall away (9th September).